Pizza is a savory dish made with a form of flatbread and usually topped with tomato sauce and cheese. 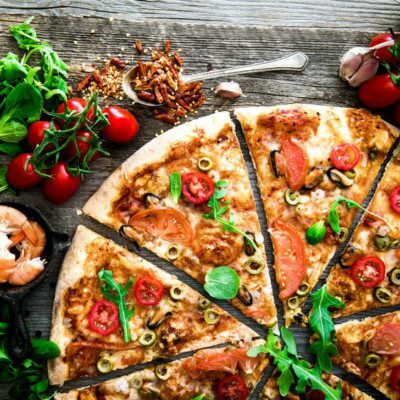 The word “pizza” is thought to have come from the Latin word pinsa, meaning flatbread. A survey from the USDA shows that between 2007 and 2010, 13% of the U.S. population aged 2 years and consumed pizza on any given day. The percentage for older children (6-11 years) and adolescents (12-19 years) is 22%. For adults 20-39 years it is 15%, for those 40-59 years it is 10%; and for those 60 years and over, 6%. For the U.S. population, pizza contributed 6% of the total energy for all children and 4% of the total energy for all adults. On the day consumed, it provided approximately 27% of total energy among all consumers. Sweet: a dessert form of pizza topped with a variety of nuts, candied fruits, etc. Flour: Pizza doughs do not require strong bread flour. This is because it creates an elastic dough that is difficult to stretch. Therefore, all-purpose flour, or flour with a lower protein quantity (<12%), is better suited for making pizza. This would ensure that the dough is easy to pull and stretch without breaking. Due to the process of freezing, storing, and thawing, flour for frozen dough pizza should have be good quality and high protein content. Flours from hard wheat varieties, with a protein content of 11-14%, are recommended for use in frozen dough products. Water: Optimal water absorption is one of the main factors contributing to pizza volume and elasticity. Inadequate water will produce a ‘bucky’ dough that is difficult to stretch. Too much water will produce a sticky dough that takes a long time to develop. For frozen dough usage, lower levels of water absorption are desirable, because yeast is sensitive to water during freeze and thaw cycles. Yeast: A typical yeast level used in pizza is around 1-2%. Yeast performance in frozen dough is a major issue. Therefore, higher levels of yeast (3-4% on flour basis) are used to prepare frozen doughs. Dough mixing temperatures should target around 75oF or lower for frozen dough and dough balls, so that the yeast does not experience a temperature shock when it is frozen. Sugar: A typical sugar level is 3-6% based on the weight of flour. For frozen dough, 8-10% on flour basis is recommended. Shortening: The addition of shortening is recommended at a level of 0.7-1% of the flour weight. This is required for significant improvements in frozen dough production and bread quality. Ascorbic acid: The amount used for good dough processing is 70-100 ppm, based on flour weight.5 More ascorbic acid is needed for frozen dough due to the reducing effect from the death of yeast cells during frozen storage. Ensminger, A.H., Ensminger, M.E., Konlande, J.E., Robson, J.R.K. The concise Encyclopedia of Foods and Nutrition. (1995). Boca Raton: CRC Press. Rhodes, D.J., Alder, M.E., Clemens, J.C. Consumption of pizza. What We Eat in America. Feb. 2014. https://www.ars.usda.gov/ARSUserFiles/80400530/pdf/DBrief/11_consumption_of_pizza_0710.pdf. Accessed 06 July 2017. Singh, P., Goyal, G.K. Functionality of pizza ingredients. British Food Journal 113.11 (2011):1322-38. Mueller, E., Koehler, P., Scherf, K.A. Applicability of salt reduction strategies in pizza crust.” Food Chemistry 192 (2016):1116-23. Bakerpedia. Ascorbic Acid | Vitamin C | Baking Ingredients. https://bakerpedia.com/ingredients/ascorbic-acid/. Accessed 07 July 2017.